As I was developing the menu for this Saturday's dinner party, I hit a roadblock on a few items. On palette cleansers, on transition dishes. So I figured, that I'd leave them alone for a day or so, but for right now strengthen one of the courses. So I reached out to my friends. I was chatting with a friend of mine, Olympic cyclist and foodie and were were talking about mac and cheese (How he finds time to hang out and bike at such a high level is beyond me, ie. baller-dom). But such a humble dish...who doesn't like it? There it was, poached Maine lobster tail, with truffled mac and cheese (with the poached lobster claw diced in there). I feel okay introducing such a heavy hitting flavor combination as long as the flavors are managed appropriately. My risk is that it will taste busy, and I'll need a flavor to have a clear separation between the lobster claw (I love the aggressive claw flavor), truffle oil (finishing flavor), and the mac and cheese. I'm thinking even some bay leaf which could blend with a strongly flavored cheese but different enough to offer contrast. Just for a sanity check, I was also chatting on gchat with another friend of mine who loves food. Ran the idea by her and obviously cheered her up from her long work days (lots of exclaimation marks). She really likes similar foods I like (black bean clams), so I thought it was a good dose of reality to run it by her. As far as the menu goes, we'll be coming off some very styled dishes, so it will be refreshing to still have the intense ingredients, but with a plating that demonstrates a home style approach. I like your blog, it's pretty insightful into the thoughts that go with planning a decent meal. I am neither classically trained, nor have I worked in a professional kitchen for a long time, but I just wanted to give some thoughts about your lobster and mac and cheese. I think that your lobster and mac and cheese dish a bit far out. You are right to assume that it will taste busy; truffle oil, cheese, and lobster (especially the aggressive claw flavor) will most certainly pack a flavor punch, but together, they diminish the flavors of each component. Rather, I would suggest instead of a mac and cheese, a risotto. Using the lobster shell and poaching liquid, adding mirepoix and maybe some fennel, cooked down to a concentrated stock or shellfish fumet, you can achieve a robust lobster risotto, while still incorporating a strong cheese (Asiago, Parmigiano, etc) without diminishing the flavor of the lobster, as the risotto would have been cooked with the lobster stock. You can finish the dish with truffle oil, allowing it to accent the dish. Your main flavor will be lobster, the textures will be the al dente risotto, contrasted by the creaminess of the risotto itself, and the robust flavor of the lobster claw to accent the lobster risotto. The cheese and truffle oil will act as compliments to the lobster. Perhaps you might consider this as a better way to harmonize these flavors. If you are willing to stray away from the truffle oil, use sweet corn kernels to add texture to the dish, while complimenting the sweetness of the lobster. Thanks for the comment. Really appreciate the feedback. We nixed the side starch with the lobster due to time. 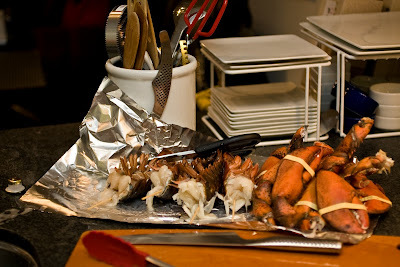 Instead we served the lobster over my brother's ciabatta with a shallot butter. I think the risotto, or creamed or highly softened starch will assume the flavor of any liquid it was cooked in, whether it be meat broth, or a lobster stock. I'll have to play with it some to see if it works in the menu here, but I've seen both mac and cheese, and risotto with lobster in restaurants and they worked well.